The Department of Mathematics at Cornell University offers a rigorous graduate program, leading to the Ph.D. degree, that combines study and research opportunities under the direction of an internationally known faculty. Competitive financial support is available through Graduate School fellowships and some graduate research and teaching assistantships. 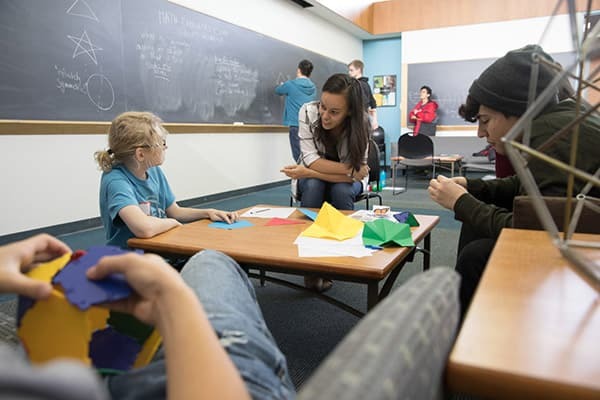 Graduate students in the department of mathematics have the opportunity to develop materials and lead activities for local middle and high school students through the Math Explorers' Club, an NSF-supported project. To learn more about the experiences of graduate students who have worked with the club, and browse the club website. Doctoral candidate, Kelsey Houston-Edwards, hosted the popular Youtube show, "Infinite Series" from PBS studios. Check out an episode of Infinite Series below, and click here to browse more episodes.